Late night washing … yes is that time again. Last night, after work, I decided to wash my hair. Sunday I wasn’t feeling well and wasn’t fit to wash my hair. I live in the Netherlands, and Monday it’s time for Real Housewives of Atlanta. So before I could watch the last part of the show I started with my routine. I used my oil mix coconut x olive oil to apply on my hair. I warmed the oil with warm water. When I did the first part, I then applied my black castor x peppermint oil mix on my scalp. After applying the oil it was time for some ratchetness *big smile*. After watching two reality shows it was time to rinse out the oils. It’s been a long time that I did a co-wash, so you know what time it is … co-wash !!!. 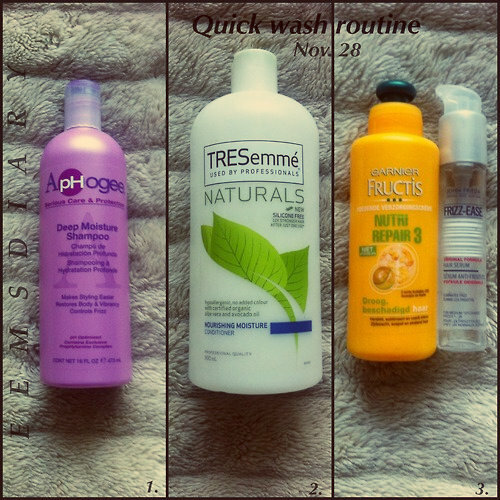 TREsemmé Naturals Nourishing Moisture Conditioner is my fav product for a co-wash. In two sections I co-washed my hair. I really concentrated on my scalp and my problem areas. Before applying the conditioner I used a t-shirt to dry my hair. In 4 sections I applied ORS HaiRepair Nourishing Conditioner. I almost forgot that I had this product. I used two packs because one simple isn’t enough. The oils that I mixed the product with; grape seed and peppermint oil. I deep condition with heat for 45 minutes and let my hair cool off for 15 minutes. a FABULOUS DINER EVENT. I was so lost what to do with my hair, but the important thing what needed to be done is wash my hair. I normally don’t do a full wash routine during the week, so I was really lost how to go about it. It was late, I was tired and had to go to work the next day. So I decided to do a quick wash around 23:00 PM (giving myself the side eye). I started with hot oil treatment. I have been looking for the best oil to use. Ugh there are so many options. So I decided to use my regular oils. What are my regular oils … well coconut, castor and olive oil. I used coconut oil for the length of my hair and my mixture of castor and olive oil (that I wanna finish) for my scalp. I warmed the oils up with hot boiled water and left it on my hair for 40 minutes. I love the way how my looks so shiny .. Let see what other benefits is has for my hair. I used Tresseme Naturals Nourishing Moisture Shampoo. I’m in loveee with there conditioned but I never used the shampoo .. so it was about time. I was my hair in 2 sections. It make it easier for me to wash my hair. I like the shampoo but I’m not in love with it yet. I’m planning to use this shampoo for the whole month. So last Sunday I decided to take off my u-part wig. I have been rocking my u-part wig as a protective style for some weeks now … 5 weeks :). Normal after 2 weeks I’m done with these protective style … but man because of the frickin’ cold weather I needed to protect my hair. So I took off my u-part wig .. Ooee I was so happy to see my hair loool .. I missed it. Anyway it was late and I was watching a Nijah movie .. so I was lazy to comb my hair. Monday it was time to wash my hair. Because I haven’t wash my hair properly for 5 weeks .. I decided to clarify my hair. I used ORS Olive Oil Creamy Aloe Shampoo. Ow woow what a week .. my hair has been shedding like crazy .. I think it’s because of the weather and also too much direct heat. I live in the Netherlands so its autumn season #smh. Normally my wash day is on Saturday .. but I had some plans yesterday. I went to a M.A.C. workshop .. I had a good time. So I’m washing my hair today. Because of the shedding I’m going to steam my hair with a towel .. yes a towel and a hair dryer. I learned this technique from http://kara-zeytin.blogspot.nl/. Below you will find here YouTube video. I DC with ORS replenishing conditioner and mixed it with different oils (Olive/Castor/Peppermint/Rosemary/Almond oil). I sat under the dryer for 30 minutes and then co-washed my hair with TRESemme. I really need to concentrate on my hair more. Lately I’ve been slacking.